Being a new longarm quilter for only two years I have tried a number of other brands of thread in my machine with mixed results. I found I was spending more time fussing with the tension than quilting my quilts. Shortly after purchasing my machine I attended MQX and decided to try the Glide thread with the pre-wound bobbins. I can’t even tell you how much I love this thread! I have no tension issues anymore and have the confidence that when I thread my machine and bobbin, my quilting stitches will look amazing. It’s such a relief to find a thread that I don’t need to fuss with and don’t end up with a headache at the end of the day because of tension issues. I don’t even purchase other brands of thread anymore because this is my go to thread...always! As far as customer service goes for this company it is fantastic! I placed an order recently and forgot to order one color that I needed. I emailed the company and they emailed me right back asking me to call them to place the order. There’s nothing better than calling a company because you forgot to order a color that you needed and are under a deadline, and have them ship it right out to you with no problems. What more could you ask for. Fabulous thread and great customer service! 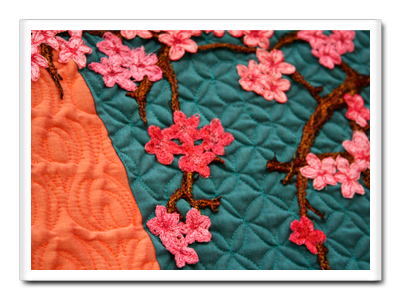 In this age of polyester threads and fabrics it has been difficult to find a thread that meets the quality and performance we traditional quilters demand. I am thrilled with your Cairo-Quilt cotton thread. Finally a cotton thread that is offered in a variety of colors that matches today’s cotton fabrics and stands up the quality I demand for my quilts. I am so excited to finally find a two in one thread that can be used for both piecing and quilting. Thank you so much for making this product. I will recommend it to all of my students and friends. I was introduced to Glide by Fil-Tec at MQX 2011, brought home several spools and fell in Love! No breakage, and the beautiful luster of the thread reflects the light giving my portraits added dimension and texture where cottons are flat and dull, not to mention the constant need to clean out my bobbin case. It's a joy to be free to concentrate on creativity and sew without frustration and the headaches of finicky thread tension, breakage and lint build up. Great tension control, less headache, beautiful colors and wonderful value! Love Glide! I found Fil-Tec threads through Karen McTavish's website, and I'm so glad I ordered some Glide thread! 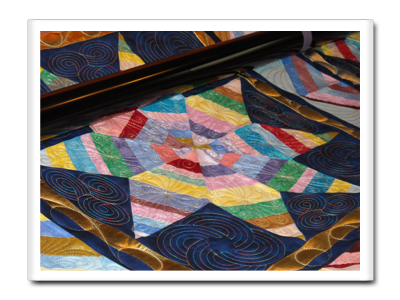 I have recently begun using the Fil-Tec Glide thread on my quilts, it is a really high quality polyester thread, I love the brilliant shine, it really shows off the free motion quilting. I use my midarm machine on a table not a frame so I love it when I don't have stop once I get going! The pre-wound magna-glide bobbins are such a great idea, I can get straight onto the fun part of making the quilt, the actual sewing! and best of all, no breaks! ... my sewing machine loves this thread! You've made one kiwi very happy." I was introduced to Fil-Tec Threads at MQS in 2010. I came home with a few spools and have been thoroughly impressed. Now that we have the rental studio open, the magnetic core bobbins make my life a breeze! The renters get perfect tension and perfect matching thread top and bottom. It's so easy to make the new longarm quilters look like pros! No matter what type of Fil-Tec thread I have tried I have loved how it performs in my APQS Millenniums & George and my Bernina. I am excited to see what they come out with next! It's been a real joy working on my completion quilts with the Glide thread! The sheen it gives them is amazing. I am so excited about switching my studio to Fil-Tec threads! I was first introduced to Glide thread by Karen McTavish at a class she taught at MQS in May 2010. I can't thank her enough for telling her students about this thread. Not only did I learn a lot from great teachers that week, but I found a thread I absolutely love! It has enough shimmer to enhance a quilt, but not enough to overshadow it. The thread nestles into the fabric so the quilting pops. I love all the colors (and would love to own each and every one of them) but I especially love “Linen”. I quilted a Blue Work Winter Wonderland quilt for a customer which had a lot of variety in the white and off white background fabrics. The Linen took on the shade of each block and blended with each one! As a quilter, I'm an admirer of thread as much as I am fabrics. I love the Glide thread and the customer service is top notch. Glide Thread is just MAGICAL. What it has done for my quilts, not to mention tension issues, is just wonderful. I love using the gorgeous colors available – they are like eye candy! The price is terrific so I can actually afford LOTS of them and using these threads has actually improved my longarm experience! As a side note, the shipping is AMAZING!! The UPS man just drove up with my thread (I just ordered yesterday)!!! Thanks...love your stuff AND your customer service!!! I cannot tell you how much I love Glide thread and Magna-Glide bobbins. I was first introduced to both while attending a class by Ronda Beyer at MQS in Overland Park, Kansas in May of 2010. I have not had one tension issue since using the bobbins and no longer deal with thread shredding or breaking. That makes my quilting day a complete joy. 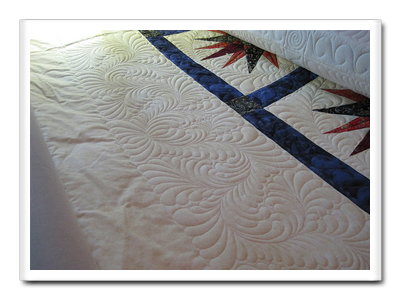 The look of the Glide thread is stunning....not too much to overpower the quilt top. My customers even express their satisfaction with the finished product using Glide Thread. Thank you for offering this fabulous product to us!! I absolutely love Glide thread and the color choices - so yummy. It has a wonderful sheen and adds just the right touch to make people say "ahhhhh.............look at that!" It is very durable and once I set the tension I can switch back and forth between colors with no issues. I am in the process of getting all the colors because my quilts just don't look right without it. Glide is the ult! I also love the cotton line with the pre-wound bobbins. I hate winding bobbins and Magna-Quilt as well as Magna-Glide fill the bill. Really, people, you are missing the boat if you don't jump on Fil-Tec's web site and order up some yummy threads! As thread trends come and go, I believe what is fundamentally and historically important to quilters is that threads do not break. A thread that does not break enables the quilter to focus on design and technique. When we can quilt beautifully - and when we work with a beautiful thread with little thought of tension issues or thread breakage - we can move on to the next level of artistry. With Glide thread and Magna-Glide pre-wound bobbins, the combination is flawless tension. Cardboard pre-wounds have been problematic for me in the past and have caused many tension issues for me, so I have always wound my own bobbins. Teaching on the road does not allow for me to wind my own for a large classroom. 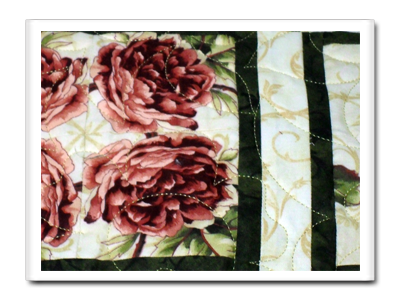 I have found that Magna-Glide pre-wounds and Glide thread is the perfect combination for hours of beautiful quilting. 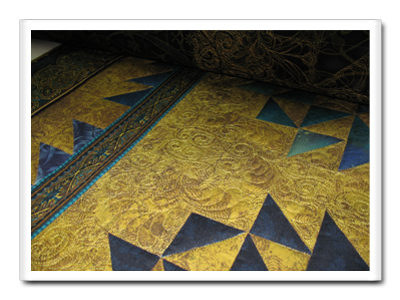 Glide adds a touch of sparkle to the quilt, which is similar to a very subtle metallic. It can be used as a traditional thread as well as an art thread. There is nothing better than quilting with a thread that shows perfect tension, doesn't break, and makes your quilting shimmer! This is the thread I use on my own quilts, when I am teaching at conventions, and when the camera is on! It’s really hard to say enough good things about Fil-Tec’s magnetic core bobbins. When I first heard of them I thought they sounded gimmicky and unnecessary, but boy oh boy was I wrong! The moment I started using them I was hooked and now I wouldn’t be without them. The combination of smooth and even winding and just enough ‘grab’ by the magnet assures perfect tension each and every time and they play beautifully with any top thread I choose to use. Even fussy specialty threads behave themselves when paired with Magna-Quilt bobbins, as this beautiful cotton is soft enough to mesh smoothly with a fussy metallic yet has just enough ‘roughness’ to it to assure secure stops and starts when paired with a slippery top thread. With Fil-Tec’s bobbins I am able to easily use different thread colors on top and bottom with no ‘pokies’ at all and the bobbins are so full of thread that it seems like I can quilt forever without having my bobbin run out. Combine this with the certainty of no backlash issues and you’ve got yourself the closest thing to a perfect bobbin! My teaching career has me traveling to various shows all over the world and I make it a point to bring my magnetic core bobbins with me to every show and to use them in all of my DVD and TV filming. There are so many variables when quilting in front of an audience and so many things that can go wrong that it’s very nice to be able to have one thing that will always work right every single time. I also use Fil-Tec’s threads (especially Glide!) exclusively in my hands-on classes as I feel that using these trouble-free threads is the best way of assuring my students a successful classroom experience. What a great product line! I can’t wait to see what they come out with next! Choosing a new thread can be difficult. I had invested in several brands in the past and was tired of always worrying about tension, breakage, and lint buildup. When I tried Glide, I knew this was the line for me! When you match this thread with the Magna Glide bobbins, it eliminates all of the guesswork on how your finished quilt top is going to look. The pure sheen of this thread really adds an extra touch of class to every quilt I've used it on. I am also a longarm dealer and when I have customers come over to try out a machine, this is the thread I always have loaded on it. I am so happy that I discovered this thread! I have been using Fil-Tec’s Magna-Glide bobbins for a couple of years and wouldn’t think about using anything else. Even though I have been buying the bobbins I had never considered buying Glide thread. I had been loyal to another competitive thread since I started doing machine embroidery and just couldn’t see a reason to change. I had picked up samples of Glide at a trade show, but hadn’t tried it yet. One day I received an email from Matt Rhodes of Fil-Tec commenting on an article in Impressions Magazine about my work. He asked if I had tried Glide thread. I told him I had a sample, but had not tried it yet. Matt offered to send me some colors other than the white and black samples I had so I would give it a good try. I took him up on his offer. As soon as I stitched out the first design with Glide thread I was hooked. 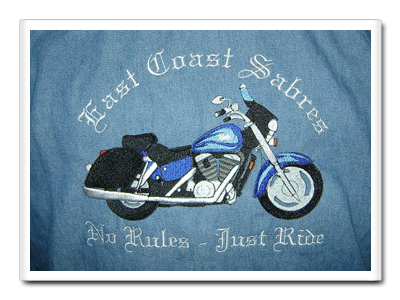 I do a lot of high stitch count embroidery on denim and need thread that will give good coverage and won’t break. Since switching to Glide, I rarely have a thread break, coverage is excellent, and the sheen of the thread is fabulous. Initially I was going to buy the Glide to replace colors as I ran out of my old thread line. But, I like it so much I have already bought most of the basic colors and many of my favorite colors and have just put the other thread away. As long as I was ordering thread, I figured I might as well give the Stabilglider backings a try. That turned out to be another good decision on my part. I have used the ClearStitch, TearStitch, Classic, HatStitch, and Peel ‘N’ Stick so far. All are great. I especially love the Peel ‘N’ Stick. It has enough stick to hold the denim, but not so sticky as to gum up my needles. In addition to offering quality products, Fil-Tec makes ordering a breeze. Generally it is late at night when I have time to order products so being able to do so online is very important. Fil-Tec’s website is logical and easy to navigate. Viewing, selecting and buying product is a simple process and I really appreciate that. Good product, pleasant buying experience, nice people – what’s not to love! I was recently introduced to a fantastic product that I highly recommend. Fil-Tec, Inc. has produced a pre-wound bobbin called “Magna-Glide.” Prior to this product, I felt that pre-wound bobbins were inferior to self-wound ones. It seemed as though the tension became affected as the amount of bobbin thread dwindled. Their Glide thread is fantastic to use both top and bobbin; it is a smooth polyester thread of a fine weight (40wt). The thread’s smooth surface texture lubricates delicate, temperamental threads nicely. Breakage, nearly nil…ibuprofen…not anymore! But the true beauty of these little round wonders is in their system of delivery. Their core is magnetic and eliminates the need for a backlash spring. Over-spinning is managed by the magnet instead. I have found that it always delivers a beautiful stitch to the last drop of thread. 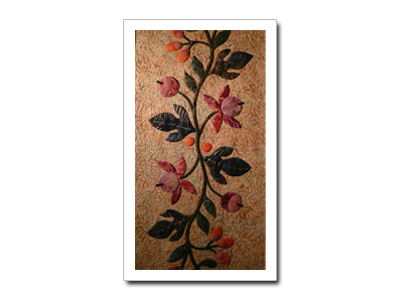 I am a professional quilter and run a long-arm quilting and embroidery business. I heard about the Magna-Glide bobbins and Glide thread on our "long-arm" forum. Several quilters were stating how much they loved the pre-wound Magna-Quilt bobbins and the company offered "free samples". Thinking that my quilting friends can't be wrong and "free samples" too, I contacted the company and had a sample package in no time. I was amazed at the customer service and the number of items sent in the "sample" package. I was "in love" with the first bobbin used. To be honest, I tried the bobbin and the Glide thread on my 2 professional embroidery machines first. The tension was spot-on perfect and the thread sewed-out beautifully. The gold thread even had a metallic sheen to it. The Magna-Glide bobbin seemed to last longer than any other pre-wounds that I previously used. 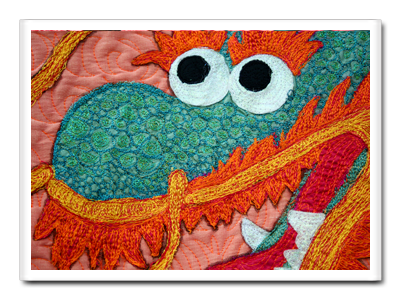 Amazed with the products on the embroidery machines, I decided to use them on my long-arm quilting machine. “Amazing” is all that I can say!!! Long-arms are picky when it comes to threads and tension. I did not have to adjust anything; the Glide thread sewed like a hot knife through butter – just beautifully. Formerly a "cotton only" quilter, the Glide thread and Magna-Glide bobbins convinced me that the "old wives tale" is out of date and modern polyester threads are safe for any fabric. They are soft, tough, and beautiful. It is virtually impossible to see where the machine stopped and started the patterns. The knots are small and easy to pull into the quilt (we knot and bury our threads to prevent the stitching from coming loose). If you're still a "cotton only" quilter, the Magna-Quilt bobbins are perfect and maintain tension with other threads. There is no such thing as "bobbin backlash" with these bobbins, which can be a quilter's biggest nightmare (bird-nests, tension, knots, etc). I no longer have to bend under my quilt to see if the bobbin thread is sewing-out correctly because I can trust these threads for perfect tension. My long-arm machine is computerized and is tough on thread due to the speed and sharp movements, as is the embroidery machine. Other threads would snap or fray at high speeds so I had to slow the machines down, but not with the Glide and Magna-Glide bobbins; they handled everything the machines gave them. Fil-Tec’s products and customer service have improved the efficiency of my business 100 percent. Keep the products coming!!! I can't wait to see more bobbin colors to match the threads. I would also like to see packs of bobbins with several popular colors in one tube. I'm off to try out the stabilizers I just purchased from www.bobbincentral.com!!! On my day off, I decided to play with Fil-Tec's trilobal polyester thread, Glide. I densely quilted a yard of fabric to use in the making of a purse. When I say dense, I mean DENSE. How about two M size bobbins that hold approximately 230 yards each! That's approximately 460 yards of Glide on top, and 460 yards of Magna Glide bobbins on the bottom in less than 1500 square inches! The thread lives up to its name; it truly glided over the fabric with perfect tension, beautiful stitches and NO thread breaks. Folks, wrap your brain around this: I quilted for over an hour and a half on this one yard (did I mention dense quilting?) and there was NO thread breakage! That ranks pretty high in my book. I do like Fil-Tec's Glide and Magna-Glide pre-wound bobbins, as well. I have also used “Glisten” metallic thread, and found it to work very nicely. I would recommend that you order Glide samples for yourself and see if your machine has as much fun as mine did today. It is American made and you can check it out with confidence. 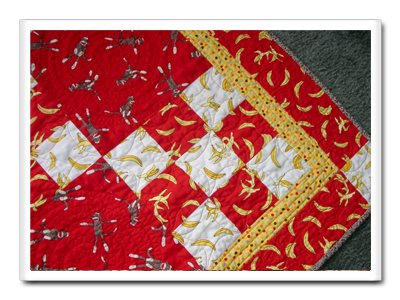 I love to quilt and I tend to quilt FAST! The one thing I hate is when my thread breaks or I have tension issues. Since I quilt for customers, this costs me money when I have to deal with either of these two issues. My longarm, affectionately known as Miss Prissy, LOVES Glide thread. I have no pesky tension issues or thread breakage. When I received my first order and opened the box, I felt as though I were looking in a bag of jelly beans. The colors were gorgeous and the sheen just added to it! I wanted to dive into the box. I have a two-year-old and I find that he takes my Glide Color card and puts it with his books, so I know I am not the only one in my house that enjoys this thread! On top of having a great product which is important, Fil-Tec’s customer service is out of this world! I commend you and look forward to doing business with you for many years to come. 1. It is very, very easy to get great tension with Glide thread. 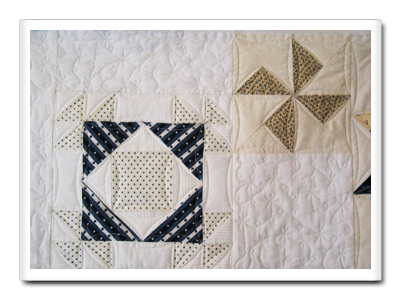 Tension is one of the number one problems long arm quilters have with thread. With other threads, you have to tweak the tension with color changes within the same brand, but with Glide, once your tension is set it works for ALL colors. In my opinion, this is most important. 2. Color: the gorgeous sheen of the thread caught my eye. This in itself really makes a quilt sing and adds just enough punch with the sheen to really accent a quilt without using harsh colors (but the colors are bold enough to give Art Quilts that extra sparkle). 3. The overall strength of Glide. As long arm quilters, there is nothing worse than a thread that breaks if we quilt too fast or quilt over a seam. Glide threads are wonderful blenders, meaning that there are several colors that will work on many fabric colors and they blend so there is no need to change colors, which saves the quilter money and time. Glide easily locks the top and bottom threads as we stop and start, making tying off and burying threads unnecessary. I love the many colors and the strength of the New Glide thread (#40). It has a reflective glow in the most glorious colors. I ordered a dozen glide trilobal thread spools in the large size (5,000 m), and will be using this thread in as many show quilts as I can. I've also had very good luck with their Magna Glide pre-wound bobbins in white. The tension is great. I have tried pre-wound bobbins before and didn't like the tension, so I was pleasantly surprised how nice these Fil-Tec bobbins are. I ordered 100 white pre-wound bobbins and can't wait for them to get more colors to match the Glide thread. They tell me they are working on this with their most popular colors. 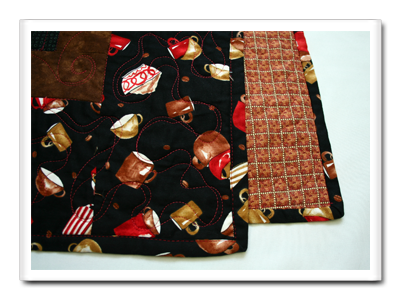 I am always looking for ways to save time when quilting. What a pleasure to quilt with Glide thread. With a quick tension adjustment, I was off and running the first time I tried Glide. Thread breakage is a thing of the past, so no more time spent stopping and starting. The color choices are vibrant and plentiful. My customers are thrilled with the results using this thread. The slight sheen of the thread picks up the light and enhances the quilting design without being a distraction. This is my new go-to thread. 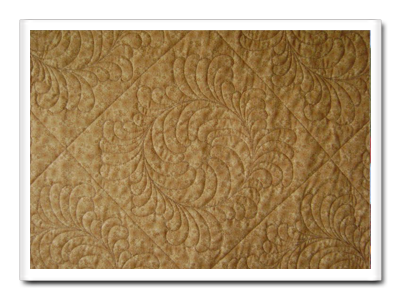 I work with Hillbrook Quilting as a Trainer for Gammill Long Arm Quilting Machines. Three years ago we were approached by Fil-Tec to test their threads and bobbins. What fun! In our first tests we learned much about the quality of Fil-Tec thread. I began using Magna-Glide pre-wound bobbins at that time. The bobbin tension is quite often the biggest challenge for quilters. I noticed that when people look at quilts they want to see the back. They are looking at stitch quality. This makes quilters very careful about achieving the best possible stitch. Magna-Glide bobbins immediately allow the tension to be perfectly managed. Most recently, I am excited about the new Glide Threads. The colors are “eye candy” for the quilter. 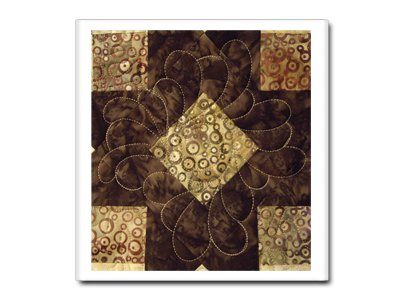 The gorgeous shine of the thread compliments our art and decorative quilting. 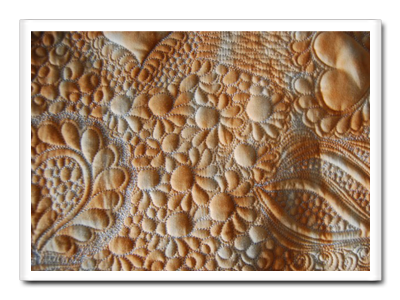 PERFECT TENSION-BEAUTIFUL STITCHES-AWARD WINNING QUILTING!!!!! The REAL reason I use Fil-Tec! I I did a quilt today using Glide. IT IS AWESOME! I am using it with my Intelliquilter. I have done 6 rows across 48" and NO thread breakage. It is beautiful on what I chose to use it on (please see photo below). Glide colors blend wonderfully – the thread looks green on the cone, it looks gold on the gold/cream background, green tint on the green leaves. NOW, I am spoiled, I had to wind my own bobbin for perfect matching. I am so used to using the Magna-Glide bobbins. I have an M bobbin on my Nolting PRO so needless to say, I also do not have to worry about running out of bobbin for quite some time. With Glide thread and Magna Glide bobbins, I have PERFECT tension, top and bottom. Fil-Tec is a great thread company to deal with. I thoroughly recommend their products to newbie long-arm quilters who are always impressed with how the Magna-Quilt bobbins remove the hassle of messing about with tension. It has been easy for me to ship thread from the USA to the UK. I am delighted to see all of the new thread ranges that are coming out to satisfy the demands of long-arm quilters. I am very pleased with the colour and texture of Glide and the Harmony variegated cotton thread. It will be featuring in a lot of my exhibition work from now on! I love Fil-Tec's Glide thread! Because the tension is always perfect, I don't have to spend time fiddling with it and can get right down to quilting! The other thing that makes me extremely happy is the way the quilting looks...it glistens...and makes the quilt look even more gorgeous! Glide is just outstanding and so reasonably priced. I know a good product and a good deal when I see it and Glide has it all! Customer service is also excellent. Thank you Fil-Tec, you've got a customer for life!! You know that feeling you get when you open a present and it's exactly what you hoped for?! That's been my experience with Glide thread every time a shipment arrives; and those bobbins - oh, my! As anyone can tell, I'm no pro with my longarm machine yet; in fact, I've had a love/hate relationship with the thing from Day One. But this thread has upped my game, for sure, and I'm finally feelin' the love! For one, I'm no longer wasting time with irritating thread breaks; two, the glow that's popping off the quilt I'm now working on is, well, drooly, for lack of a better word; and, three, even I can afford this thread! I love the stuff, and I'm so thankful for hearing about it. The customer service has been extraordinary. That first little sample pack I received was enough in itself to convince me these people mean business. They definitely have mine. My first encounter with Fil-Tec was at the Houston International Fall Market several years back. I remember a small booth with little to no display, and as I passed by I said to myself "I don't need any more thread, I have plenty.” About a year or so later, a friend gave me a spool of Glide thread; I was a little reluctant at first, but gave it a try. What can I say - I am absolutely "IN LOVE!" I could not believe the results of the thread. Best of all, I made very little adjustments to my tension, had no breakage issues and most of all the shine was gorgeous. That was all I needed to see and I placed my first order. But that was not the end of my experience with Fil-Tec - I had the opportunity to take a few longarm classes and featured at each class was Fil-Tec magnetic bobbins. I was amazed at the results, but the true test was when I took home the bobbin and tried it on my own machine. I decided to really test it and left the 100% cotton spool in the top and loaded the magnetic bobbin in the bobbin case. I did not touch my tension and just took off. I couldn't believe it - no pokies. I cannot say enough about Glide thread and the magnetic bobbins, what a wonderful combination. I'm a small shop and I do my own digitizing so I'm very picky about how my embroidery looks. I don't have years of experience, but I've learned quickly that there are differences between embroidery thread brands and bobbin brands. 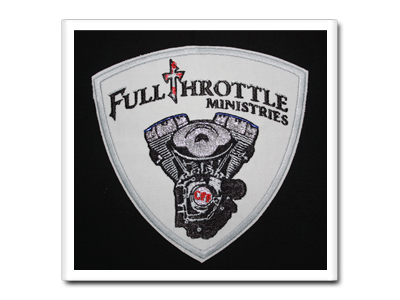 I only use polyester thread and I was satisfied with the brand I was using, but it just seemed there were too many breaks while I was stitching out a patch or a shirt. When I first got my machine, my sales rep told me that the Fil-Tec Magna-Glide bobbins were the best but I didn't like the cost so I went with a cheaper brand. I'm old enough to realize that "You get what you pay for", but I forgot that lesson. I ordered a sample pack of the Fil-Tec bobbins and since using them, I've never gone back. One day I was making a reorder for a box of bobbins and asked for a sample of Glide. After I used it I was sold. I have been replacing my other thread brands with Glide as I replace the colors and now that’s all I order. I can count the breaks on one hand since making the switch to Glide and the way the thread shines gives my embroidery the look that my customers expect. Thanks Fil-Tec! Being a long-time sewing enthusiast, I have tried LOTS of different thread. One thing I quickly realized is that poor-quality thread breaks and does not hold up long term. Funny as it sounds, the SPOOL is equally important to me because I am tired of the thread that catches the "nick" or disc on the spool. This not only jams my machine, but oftentimes it will cause the bobbin thread to pull up onto the top of the fabric as even the smallest catch will shift the tension. I had been searching for a combination of great, shiny thread on a good spool -- I found it at Fil-Tec's Bobbin Central. First I tried the Fil-Tec Magna-Glide Bobbins and I LOVE THEM! I will not use anything else -- no tension problems, no bird's nests. When it came time to reorder the bobbins, I asked for a sample of the Glide thread. One sew-out and I was hooked. I have just started a small home-based embroidery business and the first thing I noticed about the Glide thread is that when I threaded it into my embroidery machine, it slipped through the tension disk evenly and smoothly (some threads are very rough and jerky going thru the tension disks). I am hooked on Magna-Glide magnetic bobbins, and the Glide, Affinity, and Glisten thread lines! I hope they continue to expand the color pallet while maintaining a high-quality product. My goal is to build my entire thread line, all 154 spools, from their collection. Kudos Fil-Tec! PS: You can trust their customer service too! Orders are filled promptly and they have been Johnny on the spot when it comes to a fast and swift reply to all my needs. I hope they keep up the good work and great product line for many years to come! I just sold all l my other thread on Ebay, well over 100 spools! I love Glide thread, and it is the only thread I use now. 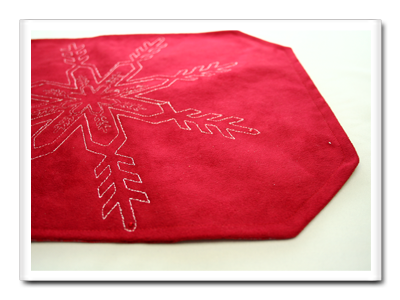 I am a home embroiderer and love putting a design on the machine and not have the thread break! I have a huge selection of colors, so my designs always bring compliments. The sheen of Glide adds a special pop to the project. I also purchase the pre-wound bobbins for my new 6 needle machine. They work great! For my new-found love, FSL, I thought I would give fil-tec backing a try. Now I only use water soluble vilene stabilizer. It holds up to dense patterns and washes out easily! Ordering needles for my machine was a no-brainer, great price for the needles I like to use. I am looking forward to seeing the new colors being introduced. Of course I will need them! I am a teacher by career, embroiderer by choice! Thanks, Fil-Tec, for great products and prices and fantastic customer service. Especially love that Glide is made in the USA! ! At MQS 2010 I picked up my first spool of GLIDE thread...Military Gold. 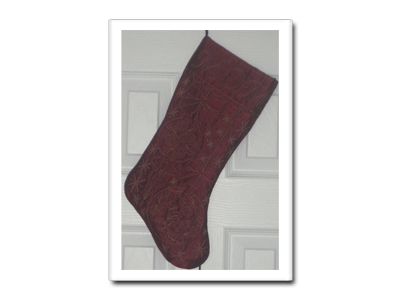 I loved the sheen and I knew it would be perfect for the Christmas stockings I had planned to make. The stockings were made of scarlet dupioni silk. The GLIDE thread made the design "pop." I made 16 Christmas stockings. Despite the intricate designs, there were no thread breaks or tension issues. 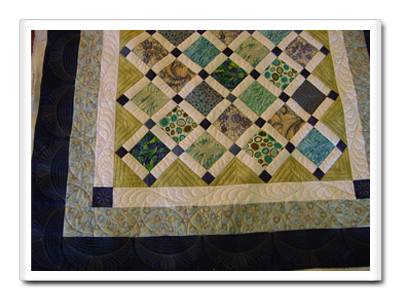 I quilt full time and I was pleased to offer Glide as a thread choice for my customers. 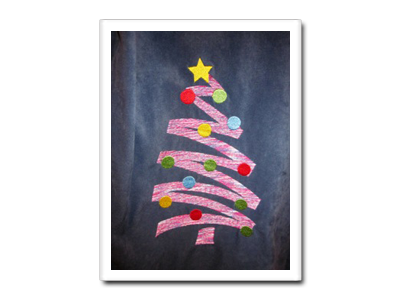 It didn't take long for the gold thread to become a popular choice on Christmas quilts. Time to order more. Guess what! Ordering was so easy. I set up an account online... Ordered some more of the Military Gold and a few new colors. The very next morning I got a message that my order was shipped. How's that for service? I look forward to trying more colors! I have had a busy longarm business for about 3 years and have used all types of thread. I was introduced to Glide and Magna Glide bobbins at MQS/Overland Park, KS in May 2010. Your thread is a dream come true! NO thread breakage, NO tension issues, very economical to use and prompt customer service. In my business, time is money and I find I'm finishing my quilting faster because there are no thread issues! Thanks! I had received some samples of Glide thread and just put it on the sewing table, and due to several factors basically forgot about it! I was in Houston this year and bought some Magna Glide Delights bobbins and some Glide thread for my APQS long arm machine. I tried both on a quilt I was doing with no breaks and they sewed beautifully. I was sold! I have since ordered more bobbins and thread to match and already making a second order. Wonderful product and service was great. Ordered and product was sent to me within a few days. Thank you so much. There are many things I like about Glide...ease, no shredding, convenience...but the best is this: I had received some Glide on mini cones, in off-white and white, for a Trapunto Quilting seminar I did at the American Sewing Expo in Novi, MI last fall. Everyone brought their own fabric and I had asked they bring light colors. I had a variety of shades...off-white, light blue, pink, you name it. I was literally amazed, as were those in the class, how the off-white Glide actually took on the color of the fabric it was used on. Just beautiful!! I absolutely love Glide Thread and the pre-wound bobbins available at www.bobbincentral.com. The variety and depth of the color on each cone makes for stunning results and it is so easy to work with that it's become my thread of choice. Having pre-wounds is a boon in time because they contain more thread, so fewer changes and no stopping to wind your own, plus I have no trouble with tension control. Couldn't get any better! Thread with a sheen, not a shine, is the way I would describe Glide thread. It flows smoothly through both my long arm and my domestic sewing machine, with absolutely no problems with tension or anything else. The line of stitching using Glide is absolutely beautiful. The colors seem to blend right in with the fabric, while providing just the right amount of shadow. When I look at all the color choices, I know I will "need" one of each! Thank you for sending me a sample, so I could actually test the fine quality afforded with this friendly thread. I have had an embroidery business for 3 years and began using a competitive thread exclusively after having terrible breakage and shredding problems with another competitive thread. Then I went to a show and received a sample cone of Glide and a magnetic bobbin. Wow, I LOVE the magnetic bobbin, no more fumbling around trying to reload! The Glide thread had a nicer sheen than the other brand I used. I read the literature on Glide and liked that the colors are run-resistant like poly and the thread had a little more stretch which helps eliminate breakage. I bought 12 king spools during a promotion and look forward to purchasing more! It is absolutely the best thread and it's cheaper than others! The cutaway stabilizer works like a charm as well. I hope one day soon my embroidery software will have the Glide colors in the thread library. I noticed you have begun naming the threads, which is very helpful. Thanks for the great products! I have just finished my 5th quilt and have the 6th in progress. I am totally sold on Glide thread! It is strong, smooth, and has a wonderful sheen without being too shiny. I am amazed at how the colours blend when a perfect match can't be had, which would seem rare with all the colours available! I requested a sample to ensure that my machine would play nice and after quilting with it for less than 5 minutes I was in love! The Magna Glide bobbins are as perfect as everyone says they are; I can see a lot of them in my future! 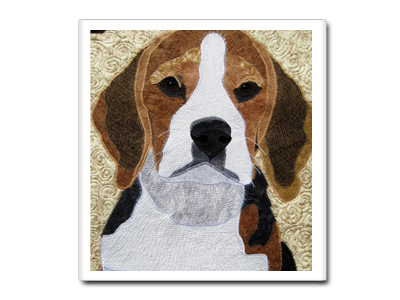 The customers I have done quilts for so far with this thread have loved it too! I liked it so much I had to have one of every colour! I must also add how fabulous the sales staff are, they went out of their way to put my order in the smallest box humanly possible to save on shipping to Canada and it arrived in less than a week! You have a lifelong customer here, and I can't wait to try Fil-Tec's other lines of thread! I have to admit, I was slow at warming to Fil-Tec's threads. I had tried them at a couple of shows when samples had been given to us to use in our booth but didn't get to really give them a workout until a few weeks ago while working a weekend quilt retreat. I had brought along my longarm machines for the ladies to book time to quilt their quilts. Due to some miscommunication, the organizers had booked each lady at 1 1/2 hour intervals and I had an over-filled schedule! Glide and Magna Glide Bobbins, Affinity Variegated, and a competitive thread and bobbin brand were the thread choices I had available. The first several ladies chose Glide & Affinity as their thread. Not a break! 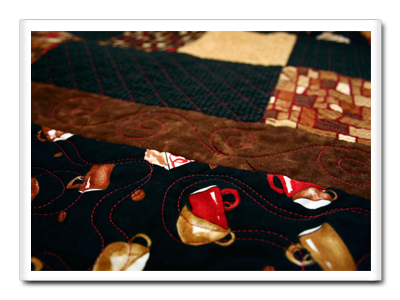 In fact, over the 2 1/2 days, we quilted 17 quilts – a true quilting marathon. The thread broke twice, but both times it was when we used the competitive brands. Not one break with the Glide or Affinity! Not only no breaks but it ran clean and lint free! I became a convert that weekend. Any thread that can perform like that is a winner! I now recommend Fil-Tec’s threads to all who purchase their machines from me and they too love it! The colors are yummy and I love the plumpness of the stitch! No flat liners from this thread! By the way, one of my biggest pet-peeves with thread is when the cones are under-wound: when the thread is wound under at the bottom of the cone during the manufacturing process, causing it to stick, and then it has to tug its way out – resulting in a loop on the quilt! Fil-Tec's thread is wound onto the cone smooth and clean. No under-winds. My hat's off to Fil-Tec! You have a great product and a new promoter! 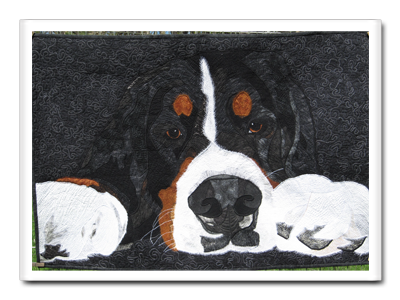 As a Professional Quilter, I strive to produce a quality product for my customers. At the same time keeping my costs and time invested at a reasonable rate. By using Glide thread I have been able to achieve both these goals. It runs effortlessly on both of my machines, an A1 and a Gammill with a Statler. The thread's sheen adds luster to any quilt. 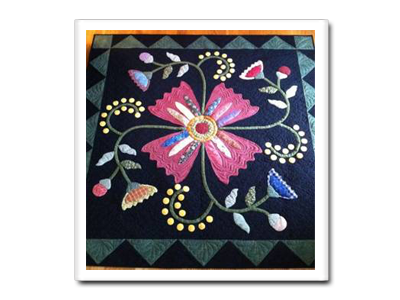 When used on wall hangings or show quilts it catches and reflects the light to show off the stitching, adding a new dimension. 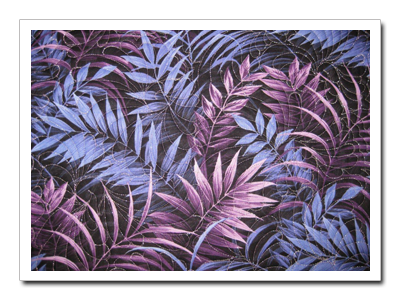 Glide is perfect to outline appliqué and embroideries. 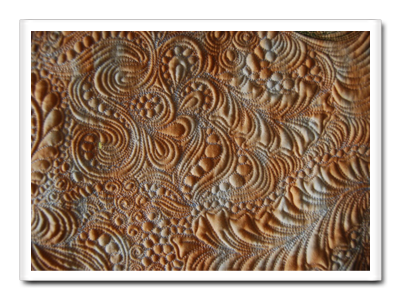 When used with Batiks, it completes the "look" I am after. It can be warm and rich, or cool and crisp. The fine weight makes for an excellent back ground fill. When lines are closely quilted, the detail is precise without the "thready" look of other threads. Small stitches are necessary to show off the detail of micro designs. Glide maintains its sheen and fineness even at 20 stitches per inch. I have used other threads that break, split, and fray. The downtime of rethreading cuts deeply into profits. Glide's strength allows me to quilt at a faster speed, even with quick directional changes, I have few thread breaks. The twist is just right. I have fewer loops coming off the cone, and I never have to use a net anymore. I am amazed at the time I save. I never want to work with "fussy" thread again. Glide thread is an excellent value. Each cone holds more thread then other brands. The snap-cone design is wonderful as well. I love being able to enclose the thread ends. I can store the thread without losing yards to tangles. Tension is an ongoing issue for Longarm quilters. I have found I make machine adjustments much less when I am using the Magna Glide bobbins with the magnetic core. I love the convenience and the time saved over winding my own. Each pre-wound bobbin has more thread then their competitors, so I stop to change bobbins less. Glide offers both quality and value. 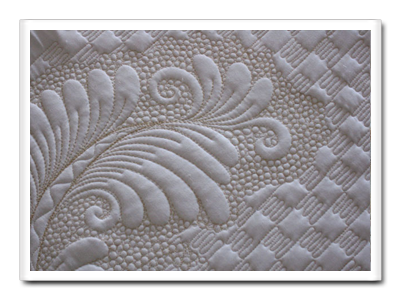 The appearance is perfect for show quilts, yet it has the strength and affordability for everyday quilts. Is it any wonder Glide is my new favorite thread? I was having tension issues as I went from one type of thread to another. Ordering a Towa tension gauge from Fil-Tec/Bobbin Central really helped as it made it easy to reset the bobbin to what was my normal. On a recommendation by Ronda Beyer I tried Glide thread and loved the look. This thread is subtle, but has a slight sheen to it that highlights the quilting without being overpowering. 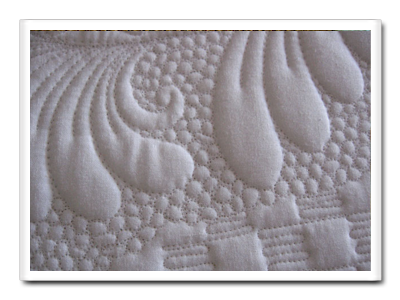 I have used it on traditional quilts and art quilts and it's gorgeous. I recently decided to try the Magna Glide bobbins too. Beautiful stitch quality, front and back! Also, there is much less rattling noise with this bobbin in; I think it is running smoother in my machine. The easy ordering and quick service Fil-Tec provides is a plus when you need a thread to finish a customer quilt! 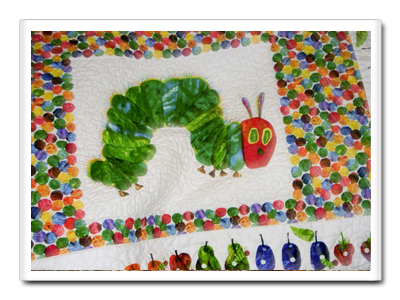 I am a professional longarm quilter and also make art quilts. 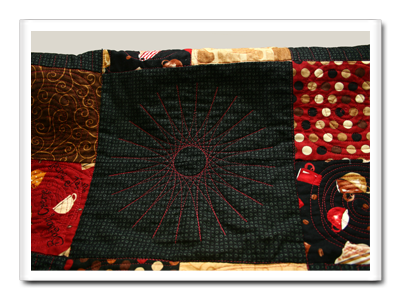 I began quilting for others in my basement studio in 1999 and moved my studio into a commercial space three years ago. 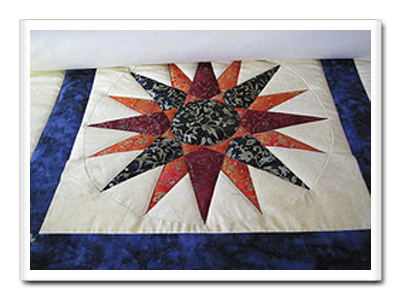 My quilting services include everything from simple pantographs to high-end custom designs. First off, let me say that I love, love, love threads and consider myself a thread junkie! When the sample arrived, right away I noticed the lovely sheen of the trilobal polyester. I used my TOWA to adjust the bobbin case tension to what I thought might be appropriate for this thread (200), then adjusted the top tension by feel. It only took a tweak or two on the top to get the tension perfect. From there, I loaded my plain muslin practice quilt and created a feather with pebbling and checkerboard. I felt this would truly test the thread with motions in all directions as well as test its ability to make the tiny round circles and tight turns. I also tried to get this thread to break by forcing it to quilt in a straight backwards (from right to left) motion at a high rate of speed. After this, I tried it on a simple pantograph that I am familiar with and can move pretty fast through. The Glide thread held its own through all of my testing... no breaks, frays, or tension issues. Needless to say, I have a new favorite thread now! I went to the Fil-Tec/Bobbin Central website to place an order and found that it was very easy to use (another plus). I had to hold myself back from just ordering one of every color available, but did manage to order a little over $150.00 worth of this wonderful thread. It came via UPS just day before yesterday and I have already started using it on my customer's quilts. I plan to order another "load" of thread next month and pretty soon, I will have a cone of every color... I can't wait!! I have ordered a few times from Fil-Tec/Bobbin Central. I send them an email and in no time, I have an answer and best of all, I am given the right answer. I have ordered their Glide embroidery thread, which is fantastic because it does not snap when embroidering with it, and their pre-wound Magna Glide bobbins, which are fantastic in my machine – actually, one of the best I have ever used. Best of all, their prices are the best prices on the internet. I was a little uneasy with ordering over the internet until I was introduced to this site. I have placed a few orders, and they turn up all the way to Australia in around seven days – fantastic! I've been using one type of thread for quilting on a long arm for several years now and have been hesitant to try anything else. My machine tends to be temperamental and once I finally found a thread that gave me the least amount of trouble, I stuck with it. Then I was introduced to Glide. This thread is amazing! I have never been able to use a trilobal thread before. Glide has the strength to run in my machine, not only well, but like butter! And the tension is always great. Not good, GREAT! I just don't have the problems I have had in the past. None. And the look is sumptuous! My customers are asking for it! I can't wait to try more! I would like to share my thoughts on Bobbin Central. 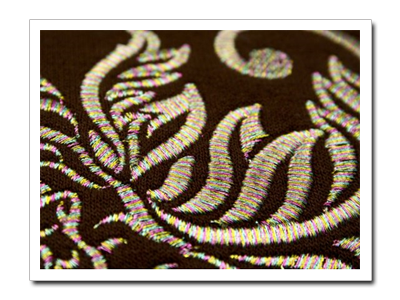 I've found they are one of the better sites for shopping online for all embroidery supplies. They are courteous and make great efforts to return phone calls and e-mails, no matter what the question or what help is needed. I wouldn't hesitate to recommend them to friends, even as far off as Australia. My friends also give good replies back. Now that’s a good feeling. Another thing I like is that they checked with me to see if I wanted to add anything else to my order to take advantage of extra space in the box and save on shipping, even after the order had been completed. I myself like that idea as at times it’s easier for them to tell when packing. Great products, prices, promptness dealing with customers, and one plus for me is the site is easy to navigate without getting confused and lost. Thank you! I run a small quilting business and have always been pleased with using KING TUT, So Fine, and all the Superior threads. When I saw some work done on a quilt using the GLIDE thread, I thought I would give it a try. I only ordered the $30 minimum amount of thread, as I wasn't sure how it would work with my machine. The thread arrived in just 2 days!! I used the Military GOLD on a Christmas quilt and OH WOW!!! I showed it to everyone that walked into the shop. They all LOVED it. I then tried the Black and WOW!! The next day I ordered about 15 more spools. I am so excited to have found this thread! You can't beat the price, the shipping is fair and FAST, the minimum order of only $30. Once you use this thread, you will be HOOKED just like I am! What do I like best about Fil-Tec Bobbin Central ….. Well, it’s the Glide thread – I just love it. The colors are just beautiful, the price is very good, but best of all is that it never breaks. Today I used Glisten for the first time ... wow! very nice and I’m so happy that the thread never broke. As for the stabilizer, I have only tried tear stitch and cut away classic. Both work great. Wonderful company and they ship your order so fast so that is why I give them 3 thumbs up. I like Glide thread because it is very strong and has extra shine and very rich colors, like going into a candy store. I quilt for friends and charity mostly, but I teach patchwork at the local college, in their evening adult programs. I have had my longarm for almost 4 years, IQ for about eighteen months. Recently a fellow longarmer listened to my story of disappointment in a poly thread I had purchased specifically for a project, and suggested I try the Glide thread. By that time I had finished my project in another thread and wasn't interested in going that route again. Then I saw the Glide thread for myself in a studio, and knew I had to try it. The colors are wonderful, and the thread is not “heavy.” I ordered several cones, had the order confirmation in an hour, and the thread shipped that day. To my amazement, my order arrived the following day. I put some muslin on the machine and was delighted when the thread ran with very little tension adjustments, produced perfect stitches, no lint, no tension problems, no thread shredding, and no skipped stitches. In addition, this is the only poly/shiny/slick thread that I've ever run without a thread net. It's never "puddled" and snagged yet...that in itself is amazing. I am hooked! My current favorite color is the 27407 gold, which I used to run a holly leaf panto on a Christmas quilt with my Nolting and IQ. The owner is coming this afternoon to pick it up, and I'm sure she will be pleased. No problems with computer assisted designs backtracking with this thread. Will recommend this thread to any and all! Thanks for a great product. Believe me – I am very busy right now, but I had to let you know how much I love the samples of Glide Embroidery Thread you sent to me. I teach machine embroidery (among other things) and I’m creating my sample quilt which is completely done in the hoop and very complex with lots of embroidery, going through multiple layers of batting and fabric. Well, right now I have a large inventory of another brand of thread which shreds at high speeds (and sometimes at slow speeds too). I’m sure I don’t have to tell you how horribly the color black shreds too! Well, your thread is fantastic. I’m zipping through all of my black satin stitches that outline my blocks – not one shred, no babying the thread or adjusting tension, NOTHING!!! I am so very pleased. As soon as my current runs out, I’m restocking with Glide Embroidery Thread and promoting it to my students as the ONLY thread to use. I use a domestic machine and I am a Certified Sulky Teacher, Certified McTavishing and Free Form Feathers Teacher, and a Certified Canadian Quilt Judge. 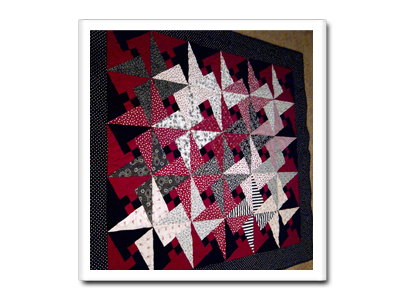 I have been teaching Beginner and Intermediate Machine Piecing classes in Ontario and Manitoba for 7 years. I really enjoy teaching Thread play and special project classes of all levels. I have been recently absorbed in heavy machine quilting. I have been trying finer threads so the work is fine and the result is not as stiff and board-like. The Glide thread which Karen McTavish gave me is the best I have used. It is very strong and never breaks. It flows through my machine like a dream. It has a lovely sheen and it doesn't fall off the cone. When I cut the end of the thread it doesn't fray and become hard to put through the needle. When I use my automatic needle threader, the thread doesn't stretch and distort. I use it on the top and in the bobbin as well. I plan to use it from now on. I have already talked to 2 shops about carrying it and I have promoted to people I have been teaching. Good job Fil-Tec! I was at the MQS show in Kansas City back in May and was at Fil-Tec’s booth. I wanted to pick up a free sample but they were out. The rep told me to e-mail the company and they would send out a free sample. I was a little hesitant about doing this, but then figured what the heck, it was free and I’ll try it. They had said good things about this at the show, but then so does everyone else about their product. The day it arrived I was in the middle of loading a quilt on my machine. I saw the colour that was sent and figured it would work for the top, and the Magna-Glide bobbin colour would work for the quilt back so I proceeded, with great caution I might add, as I was tired of getting samples that would break, loop and just not measure up what they were saying about them.…..WELL… I was surprised and awestruck; it did everything they said it would do. The Glide thread just seemed to pop with its sheen, but also kind of melt into the background and the Magna-Glide bobbin was WONDERFUL. 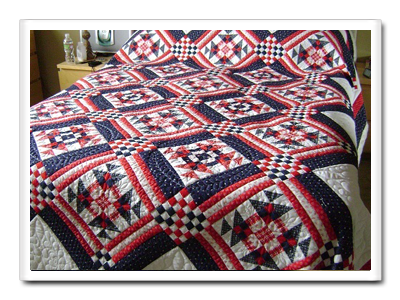 I had no problems doing that quilt and another one and even another one with both products (just wish I had had more colours at the time). I was so pleased with both products, the Glide thread and the Magna-Glide bobbin, that I called all of my quilting friends and told them all about both products, especially the bobbin. I couldn’t say enough about them and I just can’t believe the difference a quality thread and bobbin can make. I am user for life. I am a Statler owner and new user of Glide threads. I love them because I have often had issues with tension (mostly my inexperience I'm sure) but have not with the Magna-Glide bobbins - perfect every time! I also love the sheen - gives a little "umpf" to solid threads. However, recently even my Magna-Glide bobbins let me down, and after exhausting all "user error" fixes, I gave up and just wound from the Magna-Glide to one of my bobbins so that I could complete my project. I then called Fil-Tec customer service - and that is exactly what I got. I am a trainer and Customer Service Skills is one of my specialties. The staff immediately helped explain the probable cause of my issue - not providing an excuse, just an explanation - then refunded my money, let me keep the bobbins I had, and sent me a sample of their newest product - yummy thread and matching bobbins. They maintained my self-esteem and helped me solve the problem. An A+ in my book. First, let me thank you for sending the samples of Glide thread and Magna-Glide bobbins. I received them early this week and couldn't wait to try them. I must say I'm impressed. Magna-Glide bobbins are my first experience with pre-wound bobbins. I'm looking at convenience, price and, above all, stitch quality. I love the convenience... I had no idea how much I'd enjoy not having to think about or fiddle with the winding process. Considering the amount of thread you've managed to wind on that bobbin, the price is very comparable to self-winding. I'm also pleased with the stitch quality. The tension was consistent from the beginning to the end, an improvement over self-winding. I noticed a few skipped stitches, usually at the end of the bobbin, but I could see it immediately from the top of the quilt as I was working, so it was easily corrected. Magna-Glide bobbins pass my test. 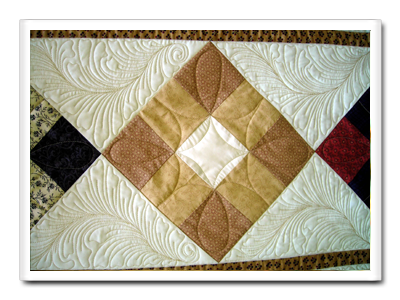 Most of my quilting is very traditional; therefore I use fairly traditional thread. I don't use much variegated and next to no metallics. I like a thin thread that disappears into the fabric. Thicker threads appear clumsy on delicate "Victorian" feathers, micro stippling and tight work. All the variegated threads I've used are too thick for my taste. The sample of Glide thread was beautiful. The sheen added a subtle luster I don't get with cotton. The stitches (with Magna-Glide bobbins on the bottom) were uniform and perfect. Without the glitz of metallic, still, my work literally shined! And, as an extra benefit, the price is super. I placed my first order last night. I ordered several colors of Magna-Glide Delights (20 per jar), some matching Glide thread, and the big box of white Magna-Glide bobbins. I appreciate the reasonable $30 minimum order. The other supplier I use has a $150 minimum, making it prohibitive for me to order one or two colors to match the quilt that just came in... forcing me to buy retail, thus never developing the needed list to fill the minimum... and, I'm happy to buy American. Thanks for "keeping your ear to the ground", listening to what the "little guy" needs! I have used the Fil-Tec bobbins in my domestic machine with satisfaction and just recently purchased several 5,500 yard spools at a recent quilt show to use in my Gammill longarm. It feels silky and smooth to the touch and I wondered if it was too lightweight to match the speed and power of the longarm. I was blown away with the performance! I completed a Christmas wall hanging in record time with absolutely no ripping, no balled up threads on the front or the back, no lint in the bobbin case and only one thread breakage (due to operator error). I quickly sent in another order before this project was even finished. I knew this was going to be my only thread to use from now on. Is it possible that this thread comes with built-in pixie dust? The quilting even looks prettier! Thanks for making this available to us. I recently attended the SUGAR conference in Columbia, MO. I am a Statler Stitcher owner and that was the purpose of the conference. I met lots of nice people and many were raving about Fil-Tec's Glide thread. I had never heard of it before this conference. Frankly, I was a bit frightened to try it when I heard that it was polyester. I have had nightmare experiences with other brand poly threads and stopped using them. This past weekend I did my first Glide quilt. From the very first stitch to the last I had perfect tension and uniform, beautiful stitches. This thread is wonderful! The colors are beautiful. This is a thread that will be an asset to my custom quilting. I will be recommending this to my customers. I received a sample of Glide thread and a couple of Magna-Glide bobbins when I was at MQS. I thought, "What the heck, I'll try it". I got it home and set it up on my Gammill and WOW! The stitching was beautiful and the tension was perfect. The thread was a yellow/gold and it looked outstanding. I was really impressed with the tension on the back of the practice piece I had; no eyelashes or loops. That was enough for me to decide to buy the set I did. Thank you for an incredible product!! Until recently, I've always tried to use whatever thread my customers requested. My APQS Freedom long arm machine has been a patient friend while I've dealt with some of the tension issues involved in trying to please my customers. In the last month, I've discovered the INCREDIBLE Magna-Glide bobbins. The tension is perfect! My mind is now on creativity instead of wondering when the next thread break will happen. 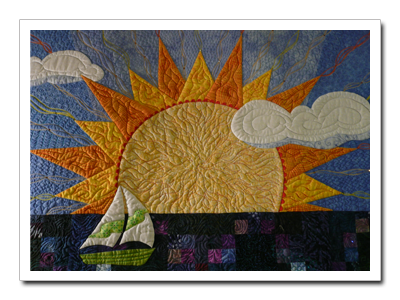 It's easy to get excited about quilting when you're sure that everything will run smoothly. After giving those magic bobbins a work-out, I ordered more colors, along with some cones of matching-color Glide top thread. My next order will include some Affinity variegated. I love the Magna Glide bobbins! I never have to make any tension adjustments when I am quilting and there isn't any lint build-up like there is with other thread brands. I have put away my bobbin winder because I only want to use Magna Glide! 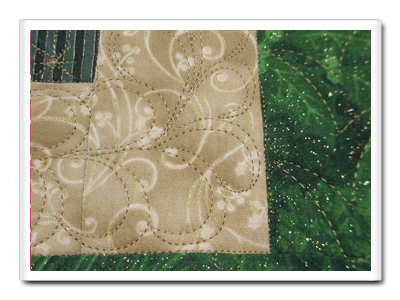 The Glide thread looks great on the quilt top – it has such a nice sheen to it and I have used it with my embroidery sewing machine, too! I now have to have every thread color!! 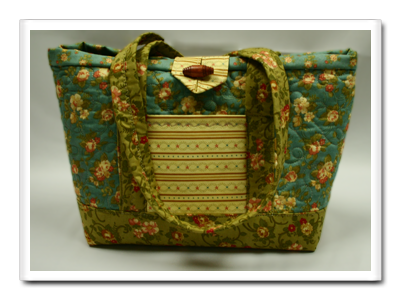 This shoulder bag (please see photo below) was sewn exclusively with Glide color number 24525. I quilted the main body of the bag with Glide as the top thread. The bobbin thread was a different thread, simply because I didn’t plan ahead! The decorative stitching on the handles and across the outside pockets was also done with Glide. I have never used a thread that was as versatile as this particular brand. With it, I can piece quilts, sew together projects, embroider and embellish with my Brother embroidery machine, and not ever have to change out the top or bobbin threads. I can use Glide for both top and bobbin threads in my APQS long arm quilting machine. Glide thread doesn’t break or shred like other threads I have used in the above applications. The shine is beautiful and works both as an embroidery thread and a quilting thread. I love it! The new Magna Glide Delights bobbins are very convenient. I just did a quilt for a friend with both top and bobbin thread in color 24525. 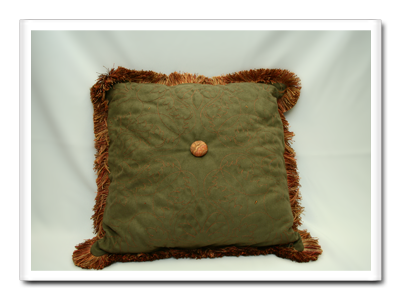 The back of the quilt was done in a soft textured plush and the Glide thread blended in beautifully. The quilt was throw-sized and I did a fairly tight pantograph, but still only used a little over three bobbins to do the quilt. They fit the bobbin case for my APQS machine perfectly and also fit in my Brother PC 8500 drop-in case. No more having to have separate bobbins for the two machines! I have found a thread that I can use in all my applications. I am a happy quilter! I got my first order of Glide thread after several members from the Red River Machine Quilters guild said how much they like working with it, and I have joined the ranks of being sold on this product! 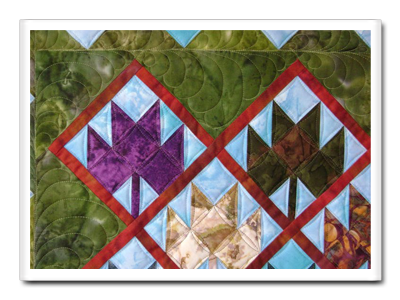 The stitches are precise and the sheen adds a wonderful quality to the quilts. The Magna-Glide bobbins are incredible - multiple thread color changes using the same bobbin and no "pokies". Thank you for another option in threads, I placed another order today to build up my color choices of Glide. I love, love, love Fil-Tec’s Glide thread! The colors are simply gorgeous, each with a slight sheen, and best of all, I never have tension problems using it. I have two longarms, both with Intelliquilters, and I can run Glide thread on t-shirt quilts, batiks, and minky with no problems. 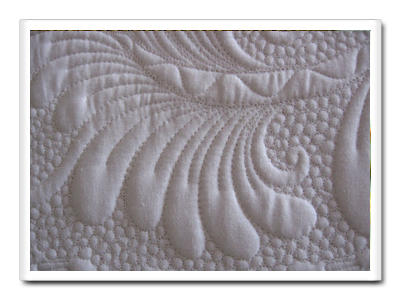 I use it for customer quilts in my longarm business, and I regularly recommend it to customers of my online pattern business, Intelligent Quilting (IntelligentQuilting.com), for use on their quilts. My goal is to have Glide thread on hand in every single color! I can't say enough about the Glide thread. It sews wonderfully, looks gorgeous and is a great value for the money. I had not heard anything about Fil-Tec or Glide thread before the MQS show in Kansas this year. It was all the buzz at the show. Once I saw it and felt it I understood the reason why. 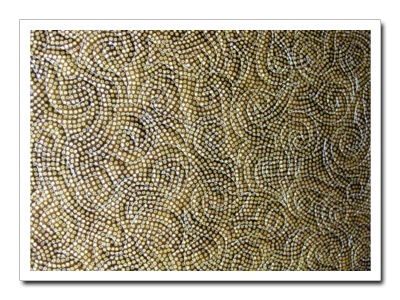 Glide is a dual-purpose thread as it looks beautiful when quilted and shines as an embroidery thread. The colors are great, too. So many colors to choose from but so many that are neutral and yet add that special touch to a quilt. There isn't a color I don't like and yes I want them all!!! The new mini spools are going to enable me to have my heart's desire. I can hardly wait for them to be available later this summer. Glide thread is absolutely wonderful and I'll be buying more and more and more, well you get the idea. Also, the Fil-Tec staff are so helpful and friendly. There is no better deal on such beautiful thread for the money. Thank you Fil-Tec for Glide thread!! Then I used it on a Sock Monkey quilt and had the same experience. 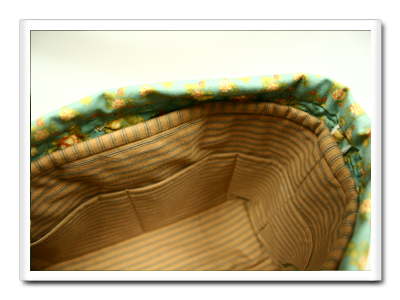 It ran like a champ, very easy to use, perfect stitches and no tension problems. And it gave just the perfect amount of sheen. 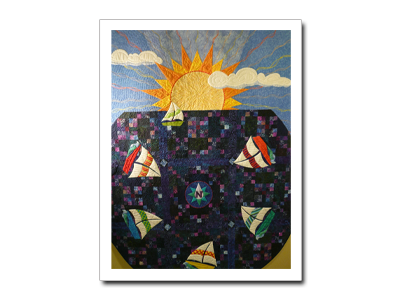 I design and make quilts specifically for show and quilt on a domestic sewing machine. I have used about every thread out there, some okay and some with terrible problems, such as bad tension, breaking and shredding. I heard about Glide thread on one of the Yahoo groups I belong to and went to your website to check it out. The colors are lovely, the price is great, and shipping was quick! I used the thread doing some free-motion embroidery and it was fantastic! I haven't tried the bobbins yet, but I'll give them a try when I reorder more thread! 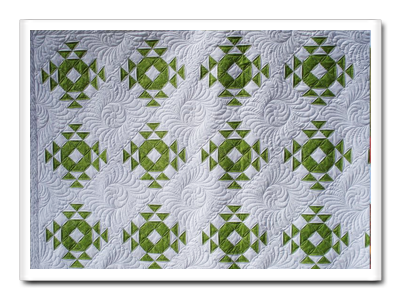 Glide makes me a very happy quilter! I just wish I knew about it several quilts ago! I recently stumbled upon Glide thread…. WOW! I heard several people raving about it and I wondered if it could really be that good? I ordered my sample pack and was thrilled from the moment I put the thread on the machine. It is that good! The thread ran smoothly through the machine and the stitches were beautiful. Even at very high speeds or while micro-stippling the thread keeps up – no breaks. 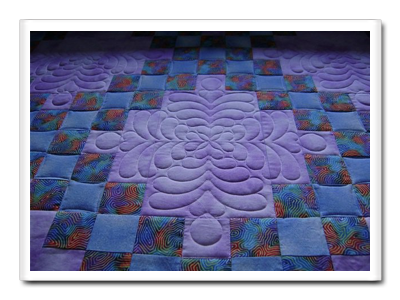 The shimmer that it reflects is perfect – enhancing your quilting as it pops off the quilt! The Magna-Glide pre-wound bobbins are AMAZING. No matter what top thread you are using, you have perfect tension. Perfect tension is something many longarmers strive for – and sometimes it is an all-out war when your tension goes “flunky”. When you use the Magna-Glides they eliminate almost every tension issue you have! The tension is exactly the same from the beginning of the bobbin until the end! As far as I am concerned Glide is the best thread out there. If you have any doubt – try them, you will be pleasantly surprised and will be a customer for life! I must chime in here and add to the other great Glide thread reviews. I had sent for a sample. It came and I was not too impressed with the color (cream/ivory with a hint of gold). I put it to the back of the shelf. Along comes a customer and wouldn't you know it, nothing in my thread collection suited her project. As a last resort, I retrieved Glide and sure enough that's what the quilt needed. I prewarned my customer that I had not worked with this brand before and did not know what to expect. I am pleased to report that I had no tension issues, no breakage and no tweaking! The rich sheen adds a lovely finish to the stitching. It is absolutely awesome. Needless to say, it no longer sits on the back shelf. Wow! I "was" a hard-core believer in winding my own bobbins until I tried the Magna Glide bobbins in my Gammill Optimum Plus. The first thing I noticed was perfect tension, no matter what thread I used on top. I was able to complete two quilts and was halfway through the third when my initial bobbin ran out. It is amazing how much thread is packed onto one bobbin! My customers frequently ask for thread that blends and that means a finer thread that sinks into the fabric--the Magna Glide bobbin threads do exactly that; they sink into the fabric. I fell in love with Magna Glide and immediately ordered an ample supply and, once they arrived, I put my bobbin winder in a drawer. Initially, I was feeling a bit tentative about trying out my sample of Glide thread. After all, I was happy with my favorite top threads and how good could it be? Well, I'm a convert to Glide thread, too! 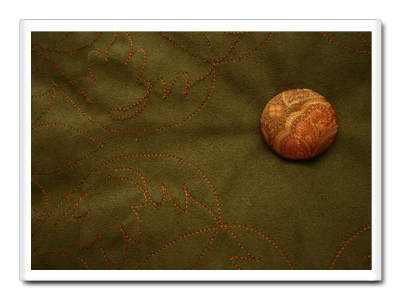 When using a matching thread color, Glide vanishes into the quilt top, giving beautiful texture. Conversely, its beautiful sheen can provide a complementary accent that really pops! If you haven't yet experienced Magna Glide bobbins and Glide thread, you are missing out on one of the best tools of the long arm quilter's trade. I LOVE my new cones of Glide Thread and love the way it looks on a quilt even more. The quilts look awesome with that added sheen the Glide Thread gives it. 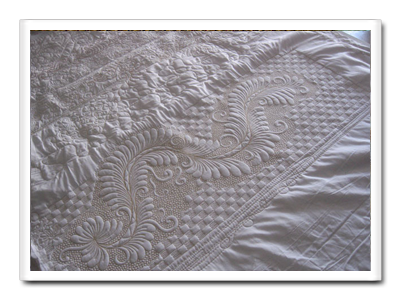 As a longarm quilter, what I like even more is that there is minimal breakage and no lint build up that other threads have. I have a computerized Gammill Statler Stitcher and I didn't even have to change any tensions, needles or speeds of my machine; the stitch was perfect! And... my customers are even happier than I am. They love the new thread and the choices of colors. 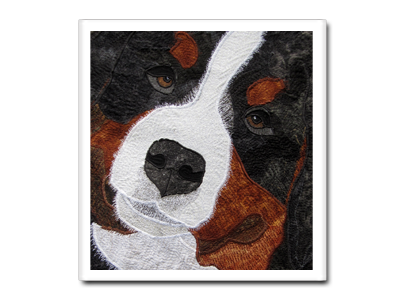 I have several quilts hanging in my studio and they are instantly drawn to the two that have the Glide Thread used on them. Needless to say, I will be ordering more Glide Thread! Glide thread and Magna Glide bobbins have become my favorite and only thread to use. I am fairly new to long arm quilting. Needless to say, there is a lot to learn and a lot of trial and error. I used another thread but was always fiddling with the tension, but no more; I just set it and forget it. Your service is excellent! The staff is great to talk to and they are very helpful. I can't wait for the release of the bobbins to match all the yummy colors of the thread. All of my friends who do long arm quilting also use your thread. I am one very happy customer and will be as long as I am doing long arm quilting. I also use your thread for embroidery...what a difference it makes...the designs just pop! Glide thread and Magna Glide pre-wound bobbins are a blessing to use on my longarm machine. Tension problems sit on the shelf when I am using Glide thread. The strength of this thread runs smoothly on my longarm and the shimmer of the thread only enhances each quilt I use it on. The shimmer of the thread makes each stitch look even better than the last one. The only problem I have is trying to pick which color to use from the vast choices of color options. It is truly a great thread and enjoyable to use. The first time I used Magna Glide bobbins I was amazed at the great tension that was achieved. There were no skipped or missed stitches. The bottom stitches looked just as great as the top stitches. When you add in the fast, friendly service that the Fil-Tec staff supplies with each order it is no wonder that this thread is gaining such popularity among the quilting, sewing, and embroidery community. I have fallen in love with all of the qualities of Glide thread and have educated my customers enough that it is their primary thread choice in my studio. I carry a lot of thread because it inspires me as a textile artist and I like to have choices. I have come to the realization that I have been using only Glide thread on my customer quilts for quite some time. I use my stock of previous threads for the wide variety of charity quilts that I make for my community, just to use it up. I no longer like the dullness of the threads; they lack life. The lint-free nature of Glide makes my machine run clean and it has to be better for the longevity of it not to have the lint in there mucking it up. When I first exposed my clients to Glide they were reluctant to take a chance. It only took one quilt for them to request it by name the next time. It gives a fresh take on the fabric and it is often unexpected. 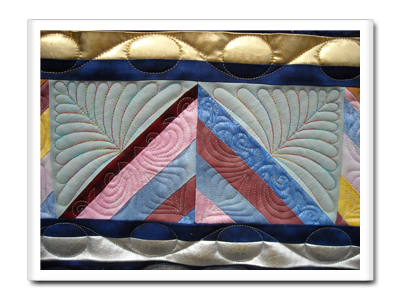 For competition/show quilts, it adds the dazzle in a subtle way and is a nice surprise. I am sold on it and so are my customers. I am pleased that your plans include expansion of color. I love that you are matching your bobbin thread to the spool in the same winding, perfect. I like the fact that you will be offering a thinner thread, great for competition quilts where you don't want a buildup of thread on the top or bottom. I am so pleased for your company that in this economy you have been able to identify a need, find the audience and run with it. Thank you for listening and being willing to expand the choices and varieties. I would also like to add that I tried the variegated thread and the Magna-Glide prewound bobbins and WOW! I had absolutely no thread breakage or tension problems and found them easy to use. That is a must in this field. Nice job Fil-Tec. I am impressed and I am not always easy to please! I love using Glide thread. The lovely shades and rich hues lure you in. My background is in graphic design, so color is of the utmost importance to me. I want the colors I use to glow, and Glide thread doesn’t disappoint! This is a very easy thread to use if you have a long arm machine. You will need to adjust your tension a bit, but it is worth it for the sophisticated look you can achieve. Glide has a low twist, and lays flat. 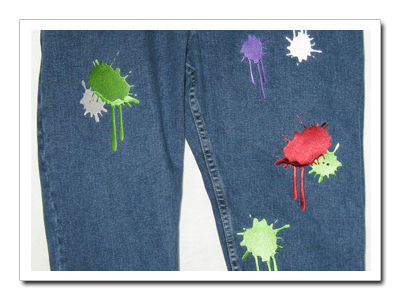 When you realize how the stitched seam looks and the sheen the thread gives your work, you will want it in every color! Pair it with Glisten metallic and you will be delighted! I have tried many other threads that I won’t name... and none come close to the ease of use and look of Glide, Glisten, and the new Affinity variegated. If you prefer cotton, Bobbin Central has those threads too! After reading such rave reviews about the Magna Glide bobbins on a longarm forum, I decided to give them a try. They are WONDERFUL. I can quilt right to the very end of the bobbin without any thread breakage or difference in the tension. Along with the bobbin, Fil-Tec sent me a couple samples of the Glide thread. It sews and quilts out beautifully as well. I also purchased a cone of Harmony variegated and Affinity variegated and I’m very pleased with both products. I will be ordering more of everything. I am a longarm quilter. I quilt mostly for myself, family, and my quilt group, but I am now getting into doing some customer quilts as well. The Fil-Tec thread products are just what I have been looking for in both quality and price. I look forward to seeing more from them in the future. I had a sample of Glide Trilobal Polyester thread from Fil-Tec Bobbin Central that I'd been saving to try out on a mini quilt top. 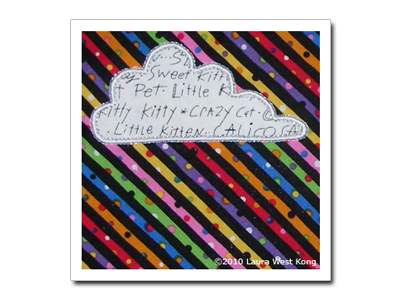 As you can see on the cloud appliqué, it satin stitches beautifully. Notice the tight curves and inside points of the cloud. (These are 4-inch blocks.) I LOVE that even though I stacked up quite a bit of thread to cover the corners and curves, this thread was fine enough that it didn't jam up or get caught in the feed dogs. Glide's shine matches that of rayon, plus it's colorfast. Can a Product actually change the destiny of an artist? It did for me! I have always liked the look of thread painting, and wanted to use it in my quilts. Unfortunately, every time I tried it, I had nothing but frustration. The thread would constantly break and I had to keep changing the tension on my machine with every color change. And then, I used Glide... not only was the sheen fabulous, but the thread never broke! On my domestic machine, I was even able to run 2 threads through a single needle and sew through multiple layers of tulle and stabilizers without any breakage. I tried just about everything I could think of to get Glide to break, but the only thing I broke was needles! I almost couldn't believe it! 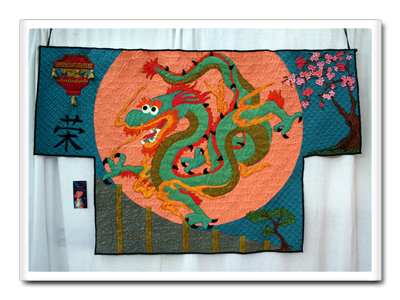 If you get a chance to visit the Fil -Tec booth at Quilt Market, you will see a kimono-shaped quilt with a large thread-painted dragon on it. That quilt, titled "Oriental Dreams" (a.k.a. "The Great Walt of China") features various thread-painting techniques done exclusively in Glide thread. 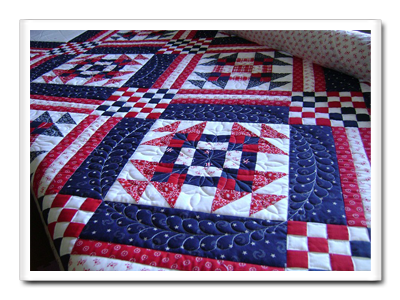 It was my pleasure to design and create the quilt especially for Fil-Tec. It was an even greater pleasure to make it using Glide thread. Glide is the BEST thread on the market because Glide does it all... thread painting, machine embroidery, free-motion quilting AND it works on every machine... domestic, long arm and automated quilting machines. Can Glide change your artistic journey? I believe that it can! 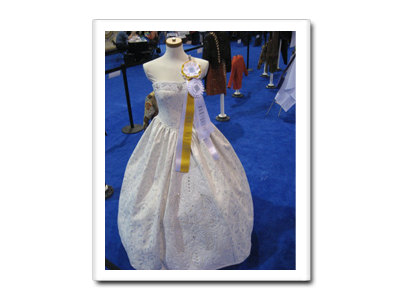 As dedicated longarm quilters, we travel to many shows and conferences to become experts in our craft. We learned about Fil-Tec’s Magna-Glide bobbins and Glide thread at a quilt show. We embraced Glide thread immediately but were a little slow to use the bobbins because we had not previously had good experiences with pre-wound bobbins. Once we grasped the fact that Fil-Tec's Magna-Glide bobbins use a very different technology involving magnets, we had to try them. Now we can't wait until Fil-Tec produces them in every color of the rainbow so we can use them exclusively. They are a great time-saver. As for Glide thread; it's practically the only top thread we use, taking precedence over any other trilobal, any other poly, and any cotton threads we once used. We have no trouble winning our customers' approval to use this thread on the top or bottom of the quilt. They, too, love Glide and enjoy looking at the large color selection we have in our studio. We know of nothing else on the market that can beat Glide for its value, its sheen and its strength. All this translates into improved earnings for us; less time changing thread and bobbins or fixing tension problems. That thread just goes on and on long after you'd expect to run out. Recently, I e-mailed a few questions to the staff at Fil-Tec. Rachel and Chris each researched different questions depending on their expertise and responded with clear, detailed answers. That personal touch is unprecedented in the industry. Have we said enough? If you haven't tried it, now's the time. I heard of the Magna-Glide bobbins on a web chat site and decided to go and look at Fil-Tec’s Bobbin Central. Because I'm a long-arm quilter, I am always looking at new products (or at least new to me) and was very interested in the magnetic pre-wound bobbins. I signed-up to be on the mailing list and within a few hours, I received a call from a Fil-Tec rep wanting to know if I would like a free sample. Within one week, it arrived in my mailbox. I tried a bobbin first, as that was what had peeked my interest. I was amazed. It was the first time in about a year that I had absolutely no tension issues. Quilting with the Magna-Glide was so effortless. Within a very short time, I placed my first order with Fil-Tec and started using the bobbins. The thread is awesome and just plain doesn't break. I don't know how they do it, but it is amazing. Now, each time a quilt comes in, I don't dread the fact that I'll be trying to sort out the tension issues. It is so good to find a product that meets all of your needs and is reasonably priced as well. Thank you Fil-Tec. I had very good results with both Magna-Glide bobbins and Magna-Quilt bobbins. The stitch appeared to have consistent tension. Now I want to rave about the Glide thread. I'm not sure where to start, so I'll start with YUM! While threading my machine, I noticed the body of the thread felt different from other 40 weight threads I've used. The other threads felt limp in comparison. Glide felt very nice and was easy to work with. I was also struck by its appearance. It seemed different to me. It appeared to be a little thicker and the color was richer. I cut a sample of Glide and a sample of my other thread and looked at them under a microscope (yeah, we are geeks that have a stereo zoom microscope in our home). The twist looked tighter and did look a smidge thicker with the Glide. Now for quilting, Glide performed very well in my machine and the stitches were gorgeous. The thread has a wonderful sheen that almost appears metallic. 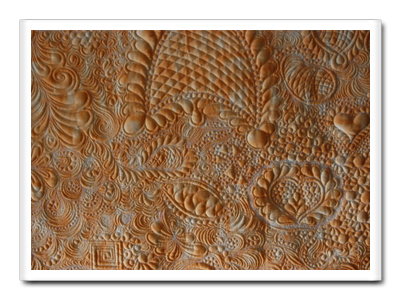 Glide is very rich in color and texture. Love it. I had no breakages at all. I also love the cone’s snap bottom where you can tuck away the loose end when not in use. Thanks for letting me try out your product. It's a great product and I am already re-thinking my thread choice for my next quilt. I have used your Clear Glide pre-wound bobbins in my embroidery machine for a few years now, and love how long they last. When doing a large embroidery design it is great not having to keep changing bobbins. I have been reading on the Quilting forum how people love your Glide thread for their top thread in their longarm machines, so thought it was time I tried it for myself. I am so excited for my order to arrive. I am very pleased to hear that soon we will be able to buy matching bobbins to go with the Glide thread!!! I would just like to add that I live in the UK and have found your website easy to navigate and place my order. I also appreciate that orders are dispatched quickly with a tracking service. I learned of Fil-Tec Glide thread and Magna-Glide bobbins from a close friend. I tried the Glide thread and Magna-Glide bobbins and it was like quilting through butter. The tension is perfect and consistent from the beginning of the bobbin to the very end. The stitches are glossy and just beautiful. The company is great to work with and I love the fact the thread is made right here in the United States. If you are a long-arm quilter, try the Glide thread and Magna-Glide bobbins. You will love them. 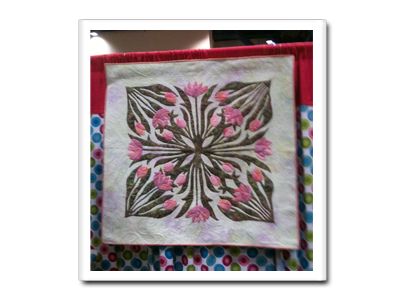 A friend and I were first introduced to Fil-Tec threads at the Quilt Market in Portland, OR in the Spring of 2007. I tried the Glide thread and loved it, but, because I had never been a fan of pre-wound bobbins, I put off using them. About a year ago, I loaded a practice piece and, being the lazy soul I am, decided just to use the Magna-Glide pre-wound bobbins. I was blown away. I had perfect tension, the stitches just sank right into the quilt and the stitching was so even and lovely. I now rarely use anything else in the bobbin. Another big plus to the Magna-Glide bobbins is the core recycling program. I am very much into recycling and was surprised and pleased to find a coupon and return label in the box with my bobbins! Way to go Fil-Tec. Magna Glide bobbins are a brilliant invention and once you try them you'll wonder what took you so long! 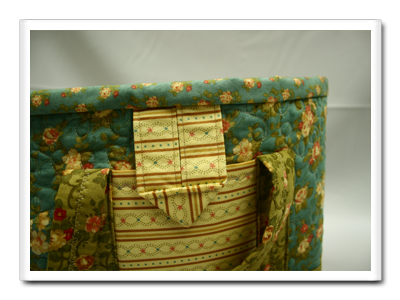 Not only do they keep the bobbin in place while you're trying to set the case into your machine, but they ensure perfect tension from the beginning of the bobbin to the end -- and with oversized M bobbins, that makes a huge difference in the quilted result. Every time I hear the bobbin 'snick' into place while sewing, I know the magnet has caught and thus prevented a case of bobbin backlash (which can lead to ugly bird nests on the bottom of the quilt). Combine this perfect tension with the minimal breakage of Fil-Tec's top threads, and suddenly you're free to focus on accomplishing the design of the quilting, which lets you be a lot more creative. Thank you for such great products! In the Fall of 2011, I took the plunge and bought my first longarm. My purchase included a three day intensive training course on a similar machine so when mine got delivered after Christmas, I would be ready to start. Flying to St. George, Utah for my class, I was excited about getting started on the quilt I had brought for "practice". Instead of jumping right in, the first half day was spent discussing batting and threads, with the pros and cons of each. In the afternoon, we started with our first project. Many people decided to do "practice pieces", ranging from charity quilts to scrap fabric to just get a feel for the machine and process. I wanted to use a "real" quilt, one I was giving to a friend for her upcoming birth of her second baby. Everyone was surprised since I wasn't doing a practice piece for my first endeavor. When it came time to start the project, the trainer led me to the Glide section of the threads we had available (we could use a wide variety different manufacturers' threads for our work) and told me this was probably the best choice to use for my project as it would be easy to adjust the tension, the thread had a great sheen, and would really "pop" on my quilt, especially with a solid black backing. Going with her selection I got started and was able to finish my first quilt by myself on a long arm. She wasn't kidding-the thread tension was simple to adjust, and after the first quilt, I practiced on two other pieces, both with Glide in the top, and other types of thread in the bobbin to work on thread tension. In all instances I had no issues with my machine tension and the stitch quality was terrific. Since I have been home, I use Glide on all of my quilts. Sometimes it may just be in the bobbin with a variegated on the top, but often I use it on both sides. While I purchased several cones while at training, I quickly located the Bobbin Central site and now purchase directly from it. I love the access to the pre wound bobbins also, which make bobbin changes a snap and I never overwind (which I often do), and the customer service and delivery are always very responsive and prompt. I have recommended this product and site to several of my friends who own long arms, and will continue to be a very happy customer. Thank you for such a great product-I can't wait to see the new colors as they come out on Facebook-and also the color card in August. I LOVE Glide, as does my machine. I am a very new (within the last month) longarm quilter. I was turned on to Glide thread and bobbins from seeing pictures on Facebook from different friends who use it. I ordered a basic set of neutral colors and a container of the Magna Glide bobbins. I love them! They work so well together that I don't want to use anything else. I was sent a box of a competitive thread when I bought my longarm from APQS, but...they don't hold a candle to Glide! Also, I never have any tension problems when using Glide thread..........LOVE IT!!!!!!!!!! A very happy customer am I!!! I have been quilting on my longarm for 5 years. I have tried all brands of thread until I used yours. All I can say is WOW!!!!! I love it. Your thread is the only one that I use. It feels like silk, quilts like butter, and I love it. I recommend your thread to every longarmer I can when they ask me what thread I use. Thanks for a wonderful product. 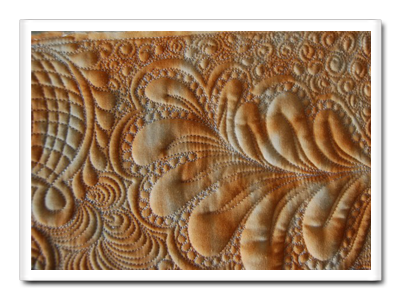 Several months ago I read about Glide thread on a long-arm quilting forum. I checked the website and was thrilled to receive samples of thread and bobbins. I love both. The Glide thread has a wonderful sheen and adds sparkle to my quilts. The thread is strong and doesn’t break or shred. I don’t have to waste time dealing with breakages as I have with some other threads. The Magna-Glide bobbins solve many tension problems. The tension is good right down to the last stitch of bobbin thread. There are no more weird stitches towards the end of the bobbin. I have found Fil-Tec to be a great company to deal with. They are responsive to the needs and requests of their customers. Questions are answered promptly in an efficient and professional way. I will not hesitate to recommend and use Fil-Tec products. 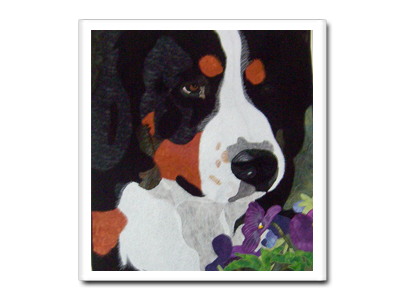 I have not been doing embroidery for very long but can see that your products are what I will be using in my business. I have experienced a tremendous decrease in the amount of thread breaks and have had numerous compliments on the work I have done using your products. Thank You so much and keep up the great work. Fil-Tec continues to produce a great products. I love their service and attention to detail. Willowtree Embroidery will exclusively use Fi-Tec. The only reason I would buy another competitive thread is if they don't have the color I need. I have not experience this issue, though. On the "About Us" page of our website we mention Fil-Tec as our pledge to purchase American made products. We LOVE this thread. It runs without looping at all, has great coverage and on difficult fabrics or hats with buckram. We NEVER get a fray or break. Sometimes we jostle just a little bit to see who gets to use the Glide stock that we have! We all want to use Glide, and cannot wait for our order to arrive! Glide has totally increased our production...especially on hats!" Just did a quick test of the Glide thread I ordered from you. I picked a competitive thread I've had problems with in the past. I wasn't sure if the digitizing, needle, hooping, stabilizer, or tension could be contributing to the problem. For my test I sewed the word "Peanut" in a curly font with the competitive thread, then replaced it with Glide and sewed it again just under the first sew out. The competitive thread had a noticeable loop, a few specks of bobbin thread showing, frayed twice, and had to be re-threaded once. Your thread sewed perfect with no stopping. I usied the same hooping, needle, and needle bar. I even got out the magnifying glass! I found a few more loops and bobbin thread in the competitive thread, but none in yours. Glide is going to make my life easier and my production better. I plan to phase out my thread collection and replace it with Glide. I may even have to put the other brands up for sale on Ebay to speed up the process! Thanks for a great product. I'm always glad to buy Made in America. Just received my order! Your thread is awesome! It has a better shine to it then the current thread I use and even has a better look to it then what the other leading threads do. You also have an excellent variation in your thread selection. I use shear backing for my sports shirts and such. I ordered your Clear-Stitch. It seems much nicer, thicker then what I have been getting. Needless to say, you have a new and very satisfied customer. Fil-Tec's Glide is the best product on the market. I was doing 200,000 stitches per patch patterns which were taking me as long as one and a half days because of thread breaks with my normal thread, which I get from one of the leading companies. The time saving with having few to no breaks is amazing. I tried the Glide product since I always had such good success with the Magna-Glide bobbin, and was able to do the same design in as little as 4 hours. WOW on the colors' vibrancy and high sheen. They are adding new colors weekly and I am looking forward to more Glide colors. The Magna-Glide bobbins are a money and time saver. The staff is more then helpful, they are all outstanding, willing to take the time to answer all of my questions. I am a true believer in your product. I use polyester thread and recently changed to Fil-Tec. This thread looks great and sews like a dream. I have had a lot less thread breaks and less tension problems. They also make the magnetic core bobbins and using them both together is a plus all around. I was having problems with the tension on my Tajima Neo 2. No matter what I did, I could not keep the tension correct. I had a tech come out and he did not have a solution. That same afternoon a sample of your new thread arrived by mail. I tried it and my Neo has never run better and the tension is a snap to adjust. I have already placed an order for some of your thread and your bobbins. Thank you for taking care of my tension problem and sending me a sample of your thread. I have found the greatest new thread. This stuff is really strong. Get a sample and do the pull test. Glide puts all others to shame. We brought in one case of bobbins to perform trials. Imagine our surprise when our operators not only were receptive to something new, but adamantly refused to switch back to the other bobbin after seeing the staggering increase in stitches per bobbin we received with Magna-Glide. Embroidery operators complained in the past about how the following shift operators would reset tensions and how they constantly had to reset it to their personal liking. Since our change to Magna-Glide, tensions remain at initial settings. We no longer hear tension adjustment complaints from operator to operator. We were absolutely shocked to realize that depending on the stitch pattern we were sewing, that we got 80,000 to 143,000 stitches per bobbin with Magna-glide. Currently we throw out our standard paper-sided bobbin at 40,000 stitches. I have never seen such a uniform stitch throughout the entire bobbin. We have significantly reduced thread breaks. Our business is based on fast order-response and high quality work. Magna-Glide is a must for both. Our test is complete and the operators are begging me to order the Magna-Glide Embroidery Bobbins in. I will be contacting our purchasing department about ordering today. The eight-head machine we ran in our booth during the Imprint Show has a design pattern of 148,000 stitches. Incredibly we completed this entire design with only one Magna-Glide bobbin change! With Magna-Glide I am able to get 20% more stitches per bobbin. At first we did not believe our own test data. Magna-Glide has a more 'even-flow,' and is not as jerky as other prewound bobbins.